Wanderlust knows no gender. It seems these days we are seeing more and more solo women RVers hitting the road to adventure. Recently, we met Debby Bradford, a dedicated solo full-timer who doesn’t seem to let anything interrupt her travels. 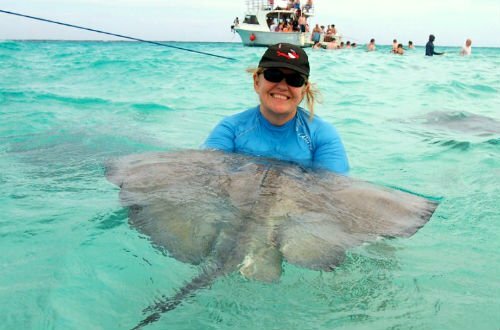 A few years ago Debby left her corporate life behind for an early retirement in the tropics. She lived the Margaritaville dream, but full-time RVing kept calling to her. When corporate America lured her back with a lucrative job offer, she accepted. Her intention was to buy and pay off off her new RV, then quit and hit the road. However, four days after signing loan papers for a pristine 2006 Winnebago Sightseer 26P, she got a layoff notice. 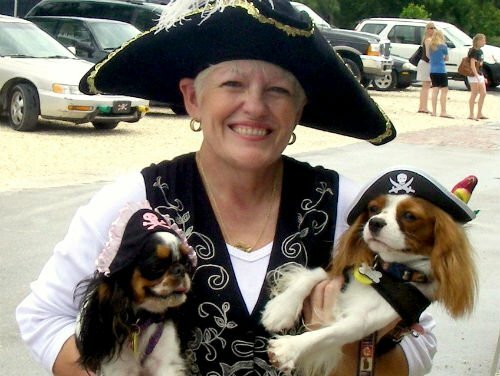 Debby with her dogs Sweet Pea (left, now deceased) and Barkley (right). “I looked hard at finances and realized that I felt I was dying a slow death in corporate America. After all, there was a reason why I retired young. So, I started looking for workamping jobs and when I found my first one I never looked back,” she says. Today, Debby and her dogs Barkley and Redford are exploring the eastern half of the U.S. The dog for whom her motorhome was named after, Sweet Pea, passed away before Debby’s pack hit the road but “She would have loved it,” says Debby. This certified SCUBA instructor has landed great jobs on the road, ranging from lifeguarding in Florida’s Ocala National Forest to managing a tourist information center in Key Largo. She’s currently part of the Amazon Camperforce team in Kentucky and next summer she’ll head to a job in Yellowstone National Park. Debby enjoys sharing what she’s learned along the way. So, we asked her what she thought are the best three tips for aspiring solo women RVers. Debby also says she never stops learning new things on the road. “Don’t let naysayers talk you out of it. It is your life to live and yours alone. Life is very short and naysayers are either jealous or selfish. I’ve heard so many other full-timers say that their grown children were very against their parents going on the road. Don’t listen to them!” Debby was kind enough to add one more bit of insight for aspiring RVing women. Curious how you handle joking up your car alone. I am contemplating being a single workamper. I drive mu 42ft MH every where, but worry about hoping up tow vehicle alone. Hi Patti, Not as hard as one might think. Today’s equipment allows you to drive your car and attach and not have to back a motorhome up to the car. I tow four on the ground. It’s easy. The most time consuming part has been gettng the toad close enough to connect the first try – lol. So happyad this post. I am hoping to retire and full time RV in the next few years. I am doing my research. Some family members don’t think it is safe or question my judgement. I am going with my heart. 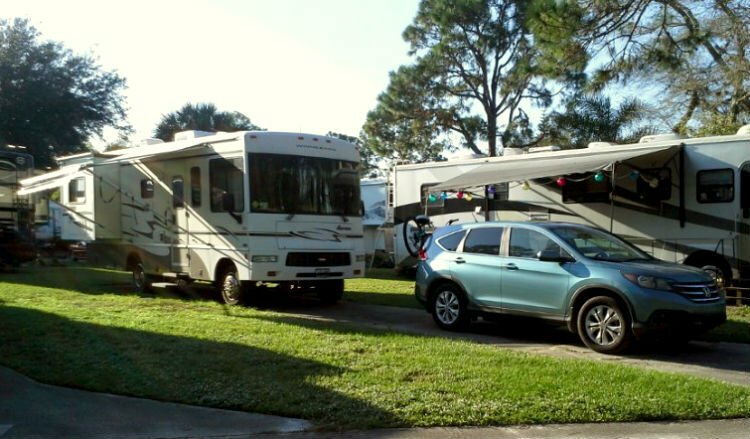 I too live in Florida but have been RV’g for 7 years now, in a towable. I have worked for the National Park Service, even before getting an RV, and for lodging concessions in parks, including 5 summers in Yellowstone. I actually started in 1995 working in the parks but not with a rig until 2011. I’ve workamped in state parks, private campgrounds as well from Atlantic Canada to Wash. state. I enjoy hearing of other single women’s adventures. Life is what you make it….and rv’g is one of the best ways to live and being safe is no different than living at home. Just be aware and don’t drive at night, don’t put yourself in strange situations. Enjoy everyone.